When I saw this recipe long ago… wooah, it looked pretty expensive. Dried scallops are not cheap and so is roast pork. I have sort of forgotten about it until 2 hours before dinner time. I was surfing the net looking at pictures of cauliflower, but don’t know why this picture of Sonia’s was included in the search. It looked familiar and I clicked it to view it again after so long. Haiya! I have everything on hand. I just took out a big chunk of roast pork to come to room temp thinking of reheating it in the oven later. Then, No no no, no reheating, I’ll be using the roast pork in this dish tonight. The recipe called for steaming on high heat for 1 hour? Err…. I think no. I won’t do that. It’s too wasteful. And so I decided to zap it, for a fraction of the time. I’m too scroogy to use scallops and so I used up the whole pack of imitation abalone for this at a fraction of the cost. So, if you want to use scallops instead, do plan ahead and soak them soft. 3. 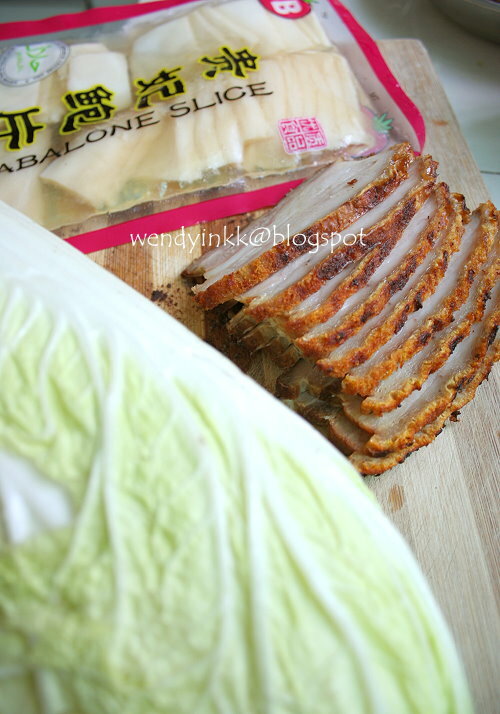 Slice roast pork thinly about 5-7mm and arrange them around the sides of the bowl. 4. Fill up half the bowl with the blanched cabbage. 5. Heat wok and put in 1Tbsp of oil and fry the garlic cloves until golden (do not wash the wok, but keep it covered until later). Put the garlic cloves into the bowl on top of the cabbage and top with more cabbage. 6. 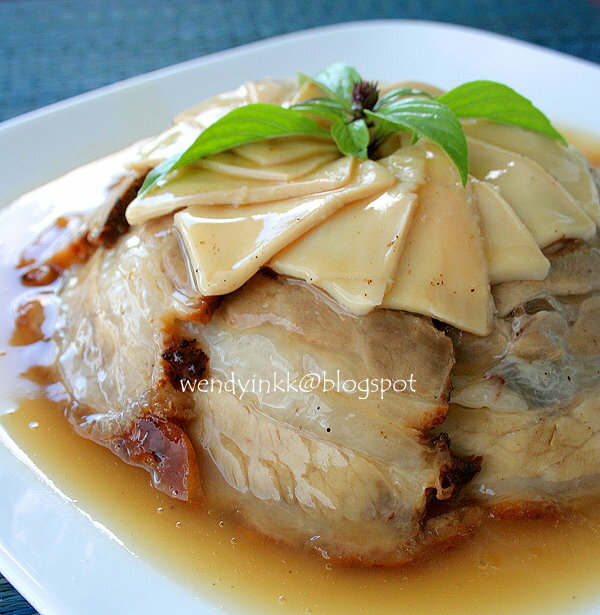 Arrange balance of roast pork and imitation abalone on top of the cabbage and pour the reserved broth over. 7. Microwave 15 minutes on medium. (you can steam it on high heat for 1 hour instead) Let it turn warm in bowl for easier handling. Cover with plate, and tilt bowl slightly to pour out all the “juices”. 8. Do this step at the sink. Place serving dish over the bowl and flip (note that “juices” may still drip out, so make sure you’re at the sink). Remove the bowl. 9. Heat up the wok (with the garlic infused oil in it) and pour in the “juices”. Bring to a boil and thicken with cornstarch mixture and put in Shao Xing wine. Taste, adjust with light soy sauce if needed, but I find that to be unnecessary. Pour the thickened gravy back onto the cabbage and roast pork. Serve. Personally, I find Yuan Siew Cabbage to be a better choice for this. Napa tasted a bit sourish.. or is it just me. 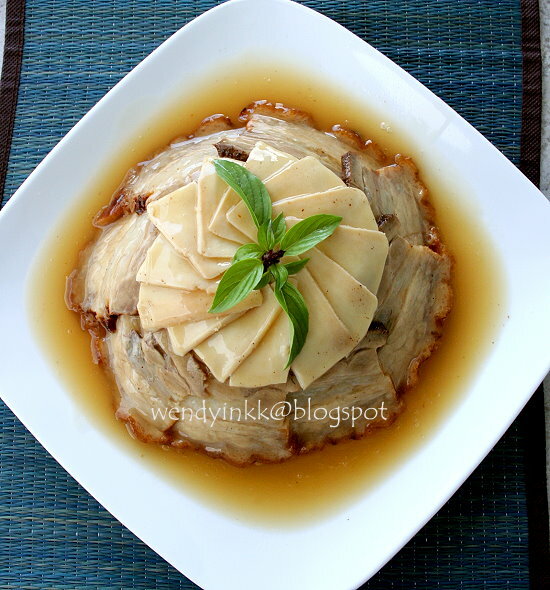 This dish is elegant enough to be served for CNY. I wonder whether can replace with chicken. This is definitely an elegant dish! wah no need to go to chinese restaurant for cny feast already! this looks restaurant quality! A beautiful dish indeed! I would love to try this but need to practice on turning the bowl on the plate! 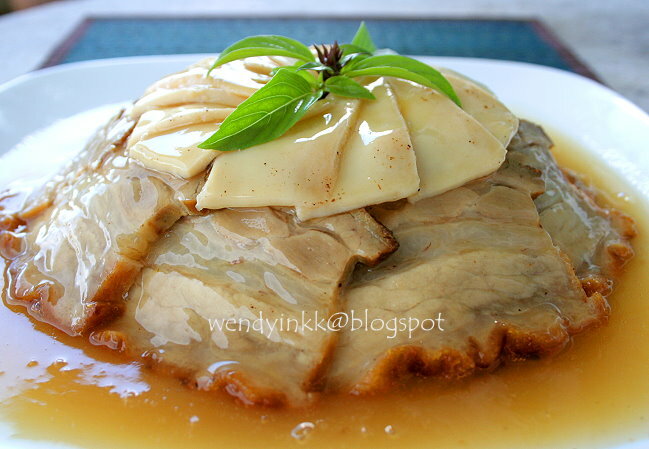 Good ideal for potluck dish during CNY. KONG HEE FATT CHOI TO YOU & FAMILY! 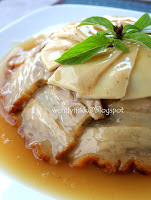 is steaming 1hr for the sliced abalone be too long? I heard it will turn out hard. Hmm..since it's submerged in the broth..I am not too sure. Sonia steamed hers for 1 hour because they are scallops.